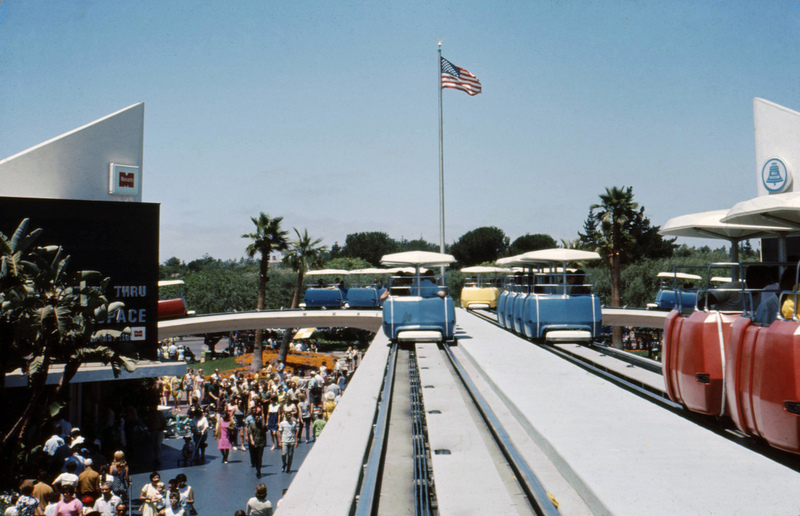 One of the most beloved attractions that appeared at Disneyland was the PeopleMover. Starting as the WEDWay PeopleMover, this slow moving ride took visitors above Tomorrowland from 1967 to 1995. 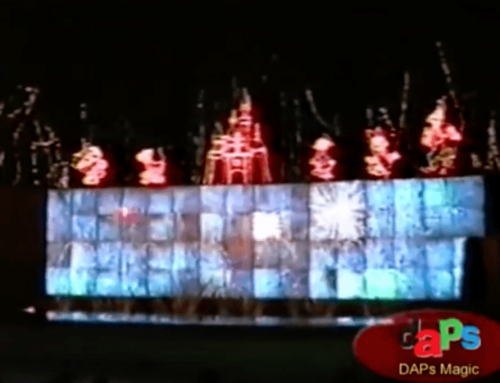 The famed attraction didn’t start out at Disneyland, and it didn’t stay at Disneyland either. 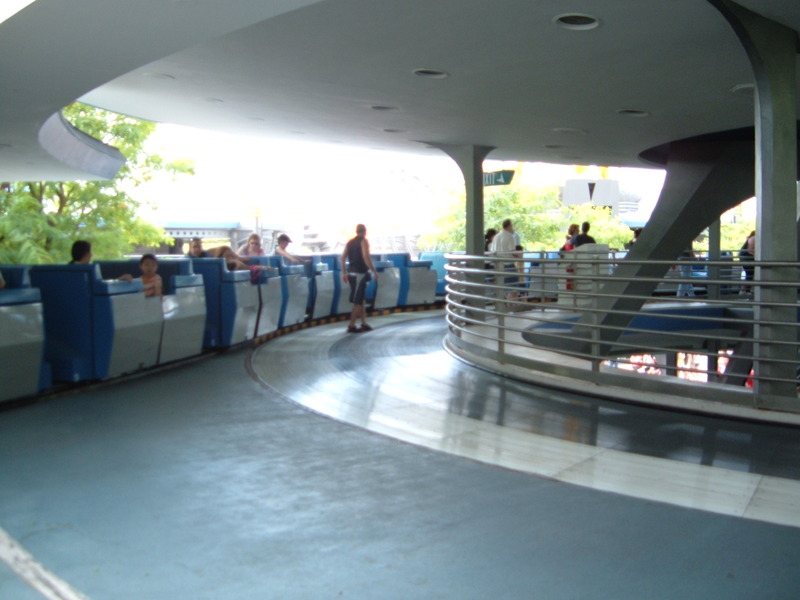 The PeopleMover was first known as the Magic Skyway. The Magic Skyway premiered at the 1964-65 World’s Fair for Ford Motors Company. Ford commissioned Walt Disney to build this ride to show off one of their models of car, though the system rode on what would become the PeopleMover. Essentially, the system was brought to the park after the World’s Fair. Cars ran on a track that used tires to propel the vehicles on a second story track. It was, perhaps, a big reason why Goodyear was a longtime sponsor. The tires would wear out fairly quick because of how they had the cars run over them. PeopleMover’s entrance was a ramp that escalated guests to the tower by Tomorrowland Terrace. Above this turntable queue was the Rocket Jets. The ride had guests view sights of Tomorrowland. An in car narration provided detail about what was seen. 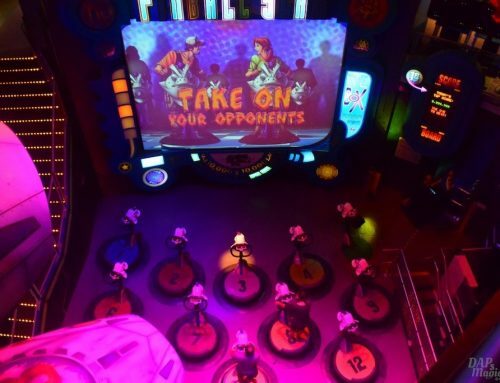 When the attraction first opened, guests traveled through Adventures Through Inner Space, the Character Shop, Circle Vision theater, throughout Autopia’s track, and over the Submarine Lagoon. A big draw was going through the SuperSpeed Tunnel, which was above the Carousel of Progress and later America Sings theater starting in 1977. This was an omnimax screen tunnel where a projected film of a race track made it feel like the ride was going faster than it really was. Changes did occur for the attraction. 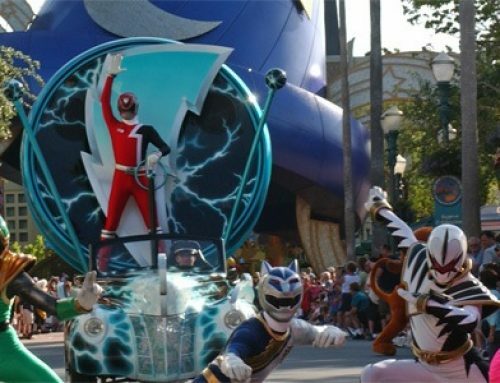 Many of the reasons were due to attractions going in and out of the futuristic land. One of the first was the game grid of Tron replacing the SuperSpeed Tunnel in 1982. The same style of projection was used, but now computer graphics from the movie took guests “inside” a computer. Another change was a stormtrooper that sort of greeted guests along the beginning of the track. This along with C3PO greeting guests on the narration came aboard when Star Tours entered the park around 1987. Space Mountain added more flavor to the ride in 1975, as PeopleMover gave a non-frightening glimpse of the thrill ride. Windows gave the darkened tunnel views of the roller coaster. The PeopleMover closed in 1995 to make way for Rocket Rods, which used the same pathway as the PeopleMover, but different track. Where PeopleMover had no motor on the vehicles, Rocket Rods had an electric motor onboard. Rocket Rods only lasted two years. Walt Disney World has their own version of the PeopleMover called the Tomorrowland Transit Authority, or TTA for short. This took the idea and initial track type of the original, but modified it. Instead of tires in the track, a linear synchronous motor was implemented, which uses magnetic technology to propel the cars. Though the attraction has closed at Disneyland, it lives on at Walt Disney World’s Magic Kingdom. And, though it is gone, the track above Tomorrowland still stands. PeopleMover has been one of the most known and popular attractions at Disneyland. 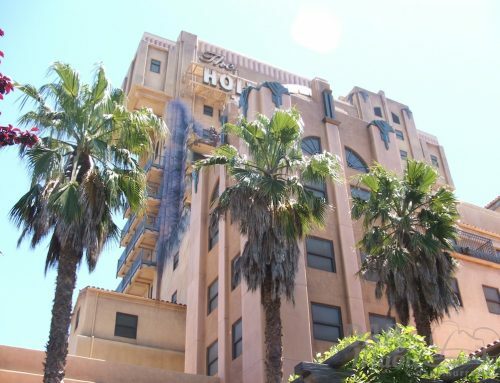 It’s revitalization is a common question among Disneyland fans. For me, this was one of my favorite rides to ride. It was a gentle way to tour Tomorrowland. It also helped perpetuate my fondness for the Tron franchise. It was a unique transportation system that has been used in other places throughout the country, besides Disney parks. 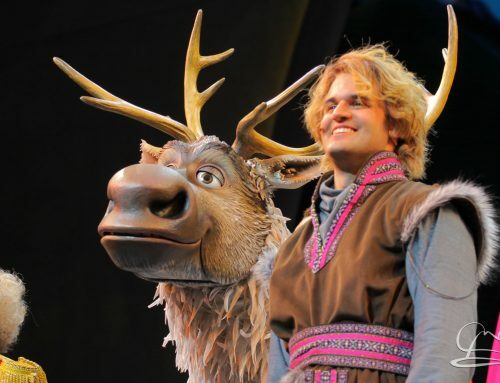 Whether or not we will see a new version at Disneyland is yet to be seen.